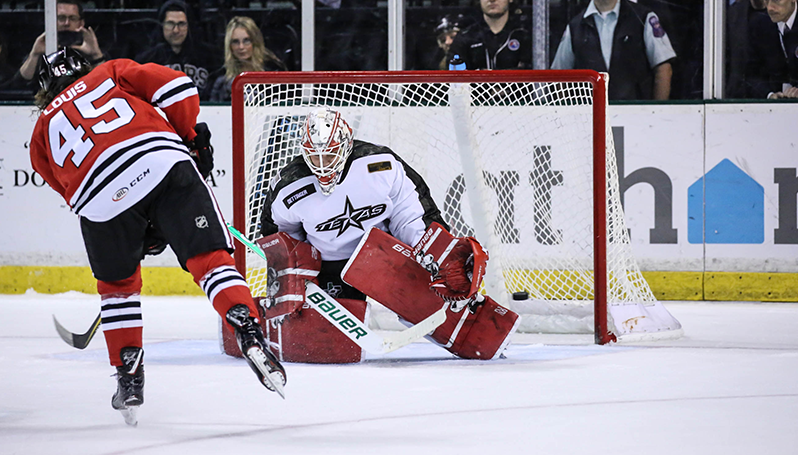 CEDAR PARK, Texas – Tyler Sikura dove over the goaltender to net the equalizing tally and force overtime, and Jacob Nilsson scored in the fifth round of a shootout to send the Rockford IceHogs to a 4-3 win over the Texas Stars Saturday night at the H-E-B Center. With the Hogs trailing by a goal and just five minutes remaining in regulation, Henri Jokiharju blasted a shot on Jake Oettinger. The netminder appeared to have swallowed the attempt, but as the puck trickled between his legs, Sikura dove and tapped the puck in the net while in mid-air to force overtime. Peter Holland matched Colton Hargrove’s tally during the first three rounds of the shootout to reach sudden death, and Nilsson backhanded a slick shot past Oettinger to lift Rockford over Texas.